When I thought back, I didn't think that I accomplished as much as I did but when I hunted down the photos, I was pleasantly surprised. 1. Friends Together Forever, 2. Inspiring Grand Ideas-2013 teacher quilt, 3. Modern Mini Mystery Round Robin 2013, 4. It's a Sister Thing Swap-Weighted Pincushion Organizers, 5. Be My Valentine-Quilt U Be Mine Mini Mystery Round Robin, 6. Crimson Diamonds, 7. Guiding Creative Thinkers-2013 teacher quilt, 8. Hugs From Team Joey-A 100 Good Wishes quilt, 9. Ghastlie sewing machine cover 10. Tending Young Gardens-2013 teacher quilt, 11. Paisley's Wishes-A 100 Good Wishes quilt, 12. 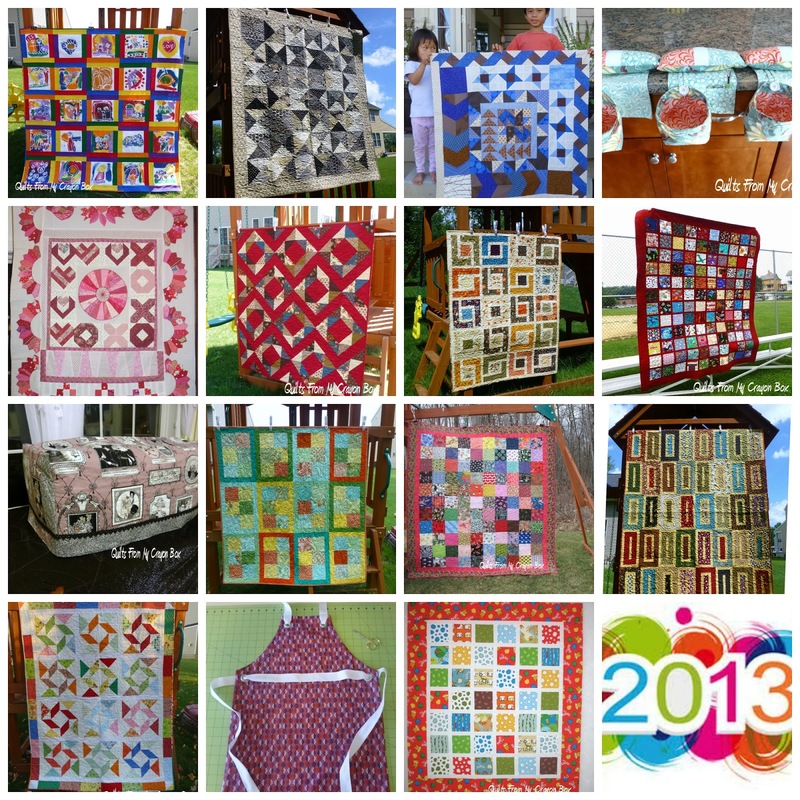 Nurturing Young Explorers-2013 teacher quilt, 13. Dots in the Wind 14. Kids Art/Chef Apron, 15. Where's the Lorax? Not too bad overall for the year considering all the other things that I had going on. 2014 is going to be an even better year and I'm looking forward to lots more creative time to come. I had planned on getting this post live before 2013 was over but I literally crashed last night really early. Oh well. It always helps to look back and see just how much you accomplished. Hey Michelle! You sure accomplished alot! Good for you! What website did you make your photo collage from?